We carry commercial quality single booth benches, double booths, L-Shape Booths, Half Circle Booths, C-Shape Booths, Three Quarter (3/4) Circle Booths. We make them in contemporary and retro styles. They include: V Back Booths, Banded Back Booths, Smooth Back Booths, Hot Rod Chevy Booths, Button Back Booths and Custom Design Booths. If you are a designer and want something special, you have come to the right place. We also have tables with your choice of Formica laminate and your choice of polished aluminum, black plastic, brown plastic, or laminate table edging. Call us at 901-873-2071 for restaurant booths, retro diner booths, waiting benches, countertops, tables, chairs and stools. All About Diner Booths . . .
Why are your booth prices so low? Actually our prices are fair. They seem low because so many other manufacturer/distributors are over charging. We believe in making a living - not a killing. That's why we have so much return and referral business. Do you cut corners to get your prices so low? Absolutly not. You can rest assured that we do not cut corners on materials, design, or workmanship. You would be hard pressed to find higher quality booths than ours. Actually, I have never seen better built booths. The frames are made of oak or other hardwoods and we use no-sag springs with strong steel connectors. The high density foam cushions are covered with a high grade commercial vinyl. Our entry level grade 4 vinyl is 3 grades above most manufacturers and if that isn't enough we offer grade 6 vinyls as an option. What type of table edges are available? We offer you a choice of the retro styled polished aluminum edging, a durable black plastic t-molding edge or an elegant laminate edge to match the laminate on the table top. What type of base comes with the tables? We use strong commercial bases with black cast iron cross type feet with levelers and black steel columns on our standard size sets. Longer tables generally require multible half bases. Some custom shapes require a round base. What is the size of the standard booth table? How tall are your standard booth benches? What is the depth of a single bench? A single bench is 24" from the back of the bench to the front edge of the bench. What is the depth of a double? A double is 46" from the front edge of one seat to the front edge of the other seat. Are custom lengths and heights available? Can you use my vinyl or fabric on the booths? 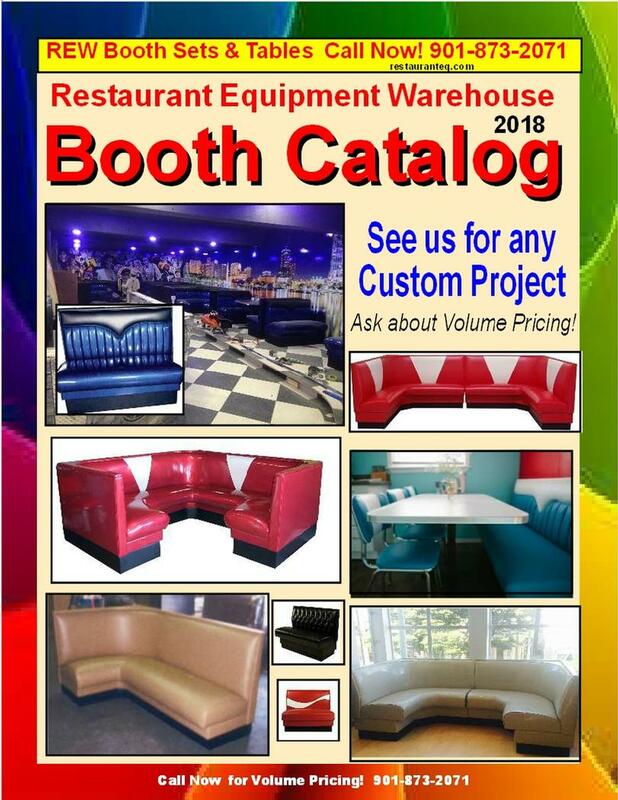 Yes, we will be happy to custom cover your booths with your upholstry. Many franchised and chain restaurants prefer to use there own design to match the window treatments or other decor. A single, sometimes referred to as an end piece, refers to a booth bench with a seat on one side of the backrest only. Although a single can accomodate a single person, a single can also be longer and accomodate 2, 3, or more people. Singles are used on the end of a row of booths or in combination with another single to make up a set commonly used by homeowners. A double, sometimes referred to as a middle or center piece, refers to a booth bench with a seat on both sides of the backrest. Although a double can accomodate a two persons on each side, a double can also be longer or shorter and accomodate 1, 2, 3, or more people per side. Double are used in the middle of a row of booths or in combination with chairs. How much room do I need for a booth set? As a general rule, a standard booth set requires a footprint of about 45" x 6'. This is actually relative as to how close you want to sit to the table. These measurements assume you want about a 3" overhang of the table edge over the edge of the seat. Larger people may want more room. I don't have a full 6 feet of space for a booth set. The 6 linear feet estimate for a booth set is based on the use of our standard table that is 30" wide. You can regain up to 6" by requesting a narrower table with the order. Tables can be made as narrow as 24". Anything more narrow than that may lose functionality. What colors of vinyl and laminates do you offer? You can see our standard and premium vinyls selections as well as our most popular laminate choices in our downloadable and printable booth catalog. I want a color that I don't see on your color chart. A common color requested that is not on our color charts is an aqua/turquoise. We can get this color. It is priced as a grade 6 vinyl (15% upcharge). If you have a cutting of something you would like us to match you can mail it to us and we will try to match it. Samples can not be returned. Can I get a sample of a vinyl that I see on your color charts? You can email us your address and the color(s) you would like and if we have it we will be happy to send it you you. Please, try to narrow your choices with the color charts in our booth catalog before requesting samples as they are sometimes in shor supply. Some colors are special orders for us and are not available as samples. I want a laminate that I don't see in your booth catalog. Our booth catalog has only our most popular laminate samples. You can choose any standard laminate from the Formica or Wilson Arts selections. See their web sites for more choice. Please, be aware that some textured and special laminates be incure an upchage or be backordered. How long does it take to build my booths? Average build time runs about 6 weeks but could be shorter or longer due to workload or availability of materials. We will be happy to get you a freight estimate using the manufacturer's generous freight discounts. (2) whether it is a residential or commercial address. Delivery to commercial addresses is gennerally less expensive. Churches are considered as residential addresses by the truck lines. If delivery is to be to a residential address, we will get you 2 freight estimates from which you may choose. (2) customer pick up from nearest truck terminal. This option often saves the customer a considerable amount. Can I pick up my booth(s) and avoid freight? Yes, we can notify you when they are ready and you can pick them up and avoid shipping costs and packing fees. However, state sales tax may apply if not shipped out of state. Can I choose a contrasting color for the piping trim and how much extra would that cost? You can choose a contrasting color of the same grade vinyl for the piping at no extra cost. How do I order booths? Although we offer some online purchases, and much communication is done by email, it is always best that we speak by phone at some point during the ordering process. Due to the many choices and options available to you for colors, styles, shipping methods, etc., and the cost of shipping, we want make absolutely sure that we get ALL the details just right on the front end to make absolutely sure you get exactly what you want. Call us at 901-873-2071.
International shipping of booths and other items requiring shipment by truck is not available at the present time. Some Canadian customers can have us ship to a freight terminal near the boarder for customer pick up. Customer would be responsible for any and all customs expenses. Some smallwares can be shipped to Canada via UPS or USPS. Check with us before ordering. Do you have Corner Booths? Yes, we can provide you with 3/4 corner units, U-Shaped units, L-Shaped units, C-Shaped units, etc. Email us with the details of what you want and we will get you an estimate. We may ask that you provide us with a simple drawing showing the dimensions you want. You can either email it to our estimate department or fax it to us at 901-881-5327.